Submitted Photo Minford’s Jacob McCaleb winds up and throws a pitch on Wednesday evening against South Webster. Submitted Photo Minford’s Jacob McCaleb aims a pitch toward the plate on Wednesday evening against South Webster. Submitted Photo Minford’s Jacob McCaleb gets ready to release a pitch on Wednesday evening against South Webster. 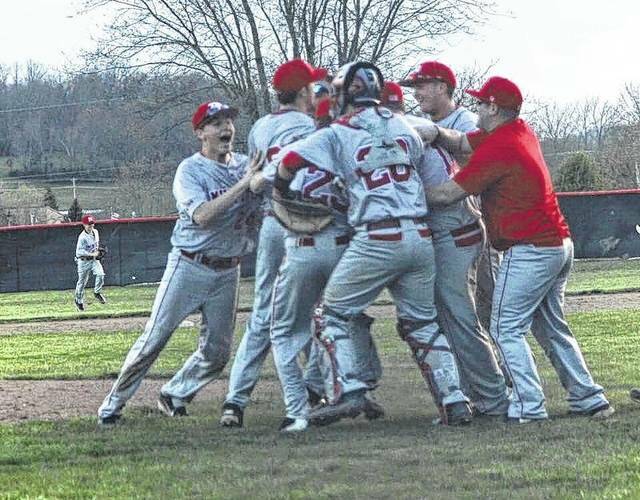 Submitted Photo Minford’s Jacob McCaleb is mobbed by his teammates after the senior threw a no-hitter against South Webster on Wednesday evening. The Falcons won, 1-0, as a result of McCaleb’s efforts. Throwing pitching gems can always make a coach’s life easier. However, when a player throws a no-hitter despite only receiving one run of support, that makes the pitching gem all the more impressive. In a critical SOC II affair that pitted two standout units against one another, Minford’s Jacob McCaleb found a way to come through in a pressure-cooker, as the senior’s no-hitter lifted the Falcons to a critical 1-0 victory over South Webster in a conference affair held at South Webster High School on Wednesday. For McCaleb, throwing the no-hitter is something that he surely will never forget. However, Aaron Hopper felt that it was an experience that was well-deserved. From the outset, McCaleb felt that he was on a nice roll from the hill. The stats certainly represent that. During the entire contest, the senior only accumulated three strikeouts but maintained excellent control throughout the contest by only walking two batters all game. A big part of that, Hopper said, was due to McCaleb’s ability to keep the ball in the lower portion of the strike zone and accumulate first-pitch strikes that ended up making his own life easier. The defense was indeed sound in the field, as several excellent plays in the outfield from Darius Jordan and Brayden Davis, along with the play of Matthew Gullett and Tyler McCormick at second and third base, proved to be crucial for the Falcons as Minford didn’t commit a single error during the entire affair. That, in turn, allowed McCaleb to focus on the next man up. Over the duration of the contest, both units were shut down by the effective pitching performances that McCaleb and South Webster hand Bradley Gee put together. However, McCaleb continued to follow the blueprint that Hopper and his brand-new coaching staff have set throughout the offseason. More importantly, McCaleb felt confident about his own ability to finish the affair out in the right manner. Which is a comment that doesn’t surprise Hopper one bit. An evident fact, considering that Minford is 3-1 on the year. On Wednesday evening, West’s Mardy Knittel also threw a no-hitter as the Senators defeated Oak Hill, 4-1, in Oak Hill. Check out a future edition of the Daily Times for more regarding that contest.